Internationales Festival für Historische Deutsche Kampfkünste | Ochs – historische Kampfkünste e.V. I’m dead tired and can keep myself upright only thriugh a continuous supply of coffee and tobacco, my muscles are a sore, my voice is almost gone, but I’m still grinning from one ear to the other: The 1. International Festival for Historical German Martial Arts was a blast! Focussing exclusively on the martial traditions of Germany, this was AFAIK the first event of it’s kind. I arrived in Bayreuth on Friday by train (as it is my habit, I love travelling by train) in the early afternoon and was picked up by my good friend Claus Drexler. Alex Kiermayer showed up only a bit later and we went to a nice French Bistro for a coffee. For all of you who come to Germany: You don’t have to be a fan of Richard Wagner to stop by in Bayreuth , it’s a nice city with a beautiful pedestrian area with lot’s of old houses, built in the distinctive style of Upper Franconia. Alex told us that the number of people had increased to ~70 -coming from all across Europe and from a lot of different backgrounds- in the last few days. Considering the fact, that we did not promote the event too much aside from a few posts here and a on a few German websites, this was an overwhelming response! While we we were talking about our expectations for the weekend, I noticed something that I considered to be a good omen: Right over the bar, unnoticed by us, there hung an old Schläger! (Bayreuth is an old University city and that still has duelling fraternities) For reasons I cannot intelligently explain, the sight of this old weapon hanging there and gathering dust made me feel comfortable, thinking that this will be a well-fated event. From the event site, we went to dinner in a nice Italian restaurant, and while we were working our way through the largest plates of antipasti that I’ve seen the guys and girls of Ochs Munich arrived. Although we don’t meet more often than two or three times a year, it was just as if we had seen us yesterday, I just love that. Claus picked up Matt Galas from the train (he travelled to Bayreuth via Nuremburg and stopped by at the Germanic National Museum to take a look at some manuals ;-)) and we hauled his and my baggage over to Lisa, one the girls from Ochs Bayreuth, who opened her home to us ‚far-traveled ones‘ again. Matt decided to stay at Lisa’s place to prepare for his classes (that guy is the greatest perfectionist that I’ve ever met) and the rest of us went back to town. Somehow, Claus had managed to reserve some spaces at the Irish Pub in Bayreuth, which was booked up months in advance because of Halloween. Here we met the rest of the crowd again, and during the evening, some of the other attendee’s showed up, among them some guys who I have never met before in person, Michael Huber and his colleagues from Paris, Colin Richards from Norway and Dave Rawlins from the U.K. The Pub was crowded to the maximum, it was loud, it was hot, the Guiness was flowing freely, the live music was excellent (they event played one my all-time favorite songs for me) and I was talking to so many people in such a short order that I did not even found the time to smoke a pipe. Eventually we left and went back to Lisa’s where we watched the (insert fanfares here) Ochs video in German, which is finally finished! 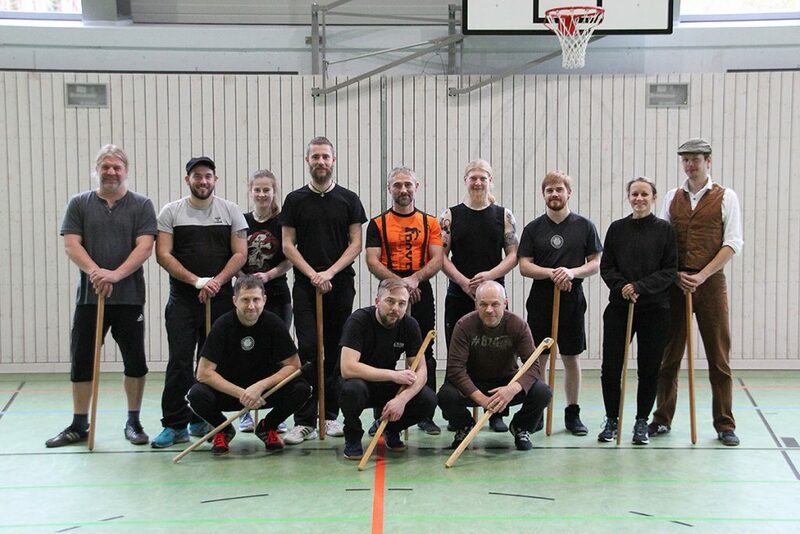 I can only second what has been said about it here: A *Top-Notch* presentation of the foundations of German longsword, done in a clear-cut and precise manner by Hans and Alex. They made the video on their own nickel, so I ask all of you who are interested in the subject: BUY IT, as soon as you can get a hold of it! 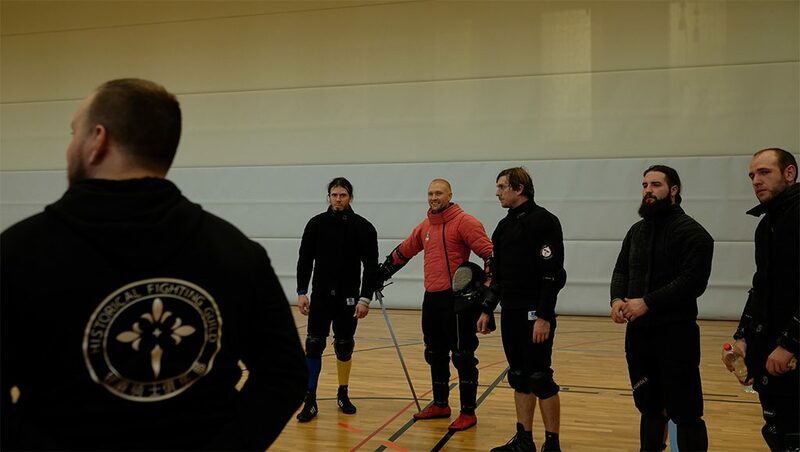 We kicked things off at Saturday morning with a short introduction of the instructors that were holding classes at the event and which weapons they were presenting: Wrestling, dagger, Messer, sword and buckler, longsword and half staff, the whole curriculum of the German Martial Arts. After everyone was thoroughly warmed through, people went to their classes and training began. I assisted Claus in a presentation about the technical and tactical approach of the German longsword, based on Peter von Danzig’s verse and glossa on the Zornhau and Krumphau. Claus showed the attendees how the Masters grounded their teaching on the natural, unlearned responses of a man, building up on what he already knows. He did a really fine job on this and managed to open some eyes, teaching not only the ‚how‘, but also the ‚why‘. Parallel to this class Hans taught the use of the Messer and Alex instructed people in the foundations of Medieval German wrestling. Knowing the martial skill and teaching ability of Hans and Alex it was no surprise that both classes were very well received. After a short break, Alex incorporated the dagger to what he established in his wrestling class while Matt Galas did a class on working from the bind, focussing on the techniques of Winden and their applications. Having seen Matt’s thoroughly structured and extremely well presented stuff in Zurich two month’s ago, I decided to tread virgin territory and I participated in Dave Rawlings‘ class on sword&buckler according to Ms. I.33, in which he was assisted by Colin Richards. To say that I was mightily impressed would be a huge understatement. I was totally, utterly blown away! Dave and Col are not only natural born showmen and top-notch chaps to hang around with, their intensity, energy and martial skill are second to none. Constantly emphasizing the need for precision, speed and power, they lead us through a series of exercises that made very clear what I.33 is about. Two thumbs all the way up! After a second break Claus continued with part II of his class about von Danzig’s teachings while Christoph Kaindel and ‚Big Man‘ Harry from ‚Dreynschlag‘ presented their interpretation of fighting with the half staff. 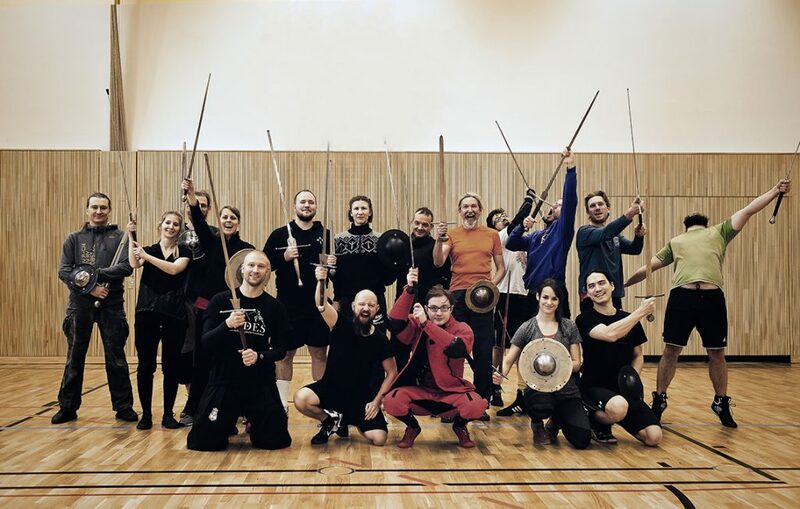 Yours truly did a class on the various aspects of Ringen am Schwert assisted by Torsten Schneyer from our fellow group ‚Zornhau‘ in Frankfurt. The first day ended with a lecture about the History of the ‚Kunst des Fechtens‘, delivered by Matt Galas in his usual impeccable manner. Starting in the time of the Romans and filled with information from period sources, Matt painted a wonderfully informative picture about the development of the art we love so much. A hearty buffet dinner at the club house of the „Bayreuther Turnerschaft“, again organized by Walter, ended a truly fantastic first day, and we instructors went an extra mile back a Lisa’s place and watched a video by one of the most (in)famous persons in the German Medieval Recreationist community, Herrmann Zu ‚der Beliebteste‘. For those of you who do not know him, he’s a Neo-Germanic charlatan as there can be one, selling gawd-awful SLO’s ground out from mild steel at hilarious prices while enjoying an almost god-like admiration from his entourage. On Sunday, I did a class on halfswording and participated in Alex’s class on unarmed vs. Dagger. He stressed very nicely how the concepts and techniqes carry over from armed to unarmed fighting and vice versa, again an eye-opener for some people who did not work with this before. The rest of the Saturday classes were repeated with a slightly different schedule, so every attendee had the chance to see something they had missed the day before. Dr. Alfred Geibig, the Head of the Weapons and Armour Collection of the Veste Coburg and Chairman of the Society for Historical Weapon and Costume Research gave a very interesting lecture about the morphological development of the sword through the Middle Ages. Building up on the principle ‚form follows function‘, and backed up by lots and lots of slides of archaeological finds, he showed how one can make assumptions about the use of the sword according to it’s design, when changes in weapon design occured and why this did happen. Although people’s heads were already quite stuffed from all the previous information, his lecture was very well revceived and he took lots of time to answer questions afterwards. Everyone felt Dr. Geibig’s love for the subject and was deeply impressed by his immense knowledge. Maybe he’ll join us again in future events, perhaps even on the practical side with a sword in his hands. During the lunch break, Colin gave us an impromptu demonstration about his interpretations of sword and shield use. Having no experience with this fighting style, I was very impressed to see the different ways to use the shield defensively and offensively and the next thing on my equipment wish-list is a good round shield so I can start to learn this formidable weapon combo. As a conclusion of the event, Hans set up his testcutting stand in the parking lot and many a watter bottle was slaughtered. So, to recap this way too long post(sorry, but I *definetly* felt like sharing this), I think it was a huge success and I think we really started something that is going to have a bright future. I want to thank all of the attendees for coming together to train with us, Lisa and her family for the outstanding hospitality, and last but not least a thundering ‚HUZZAH‘ to my fellow Ochsen Claus, Alex and Walter, who worked their butts off to organize the event and who brought to life one of the best events in my whole WMA life. And to those of you who have not been there, you have *really* missed something.